Japan aims to cut its greenhouse gas emissions by between 60 and 80 percent by 2050, news reports said on Sunday, as part of measures setting out the country's long term environmental goals. Prime Minister Yasuo Fukuda is expected to announce the target as early as June, the Nikkei and Asahi Shimbun newspapers said. Greenhouse gas curbs on industries such as power generation and steel could provide a basis for a renewed U.N.-led drive to fight global warming, Akio Mimura, Chairman of Nippon Steel Corp said on Thursday. Japan hosts the G8 summit meeting of political leaders at the Lake Toya resort area of Hokkaido in July, which is expected to discuss a new United Nations climate treaty to succeed the Kyoto Protocol, which ends in 2012. Japan is stepping up efforts to meet its Kyoto Protocol targets by buying more greenhouse gas emissions offsets from abroad than previously planned as its own emissions rise and nuclear power production dwindles. Japan has become a major emissions credit buyer, using the New Energy and Industrial Technology Development Organisation (NEDO) as its agent. Having already bought 23 million in the past two years, the government says it will buy at least 77 million more tonnes of carbon offset credits by 2012. Japanese households and businesses could end up paying more than $500 billion to cut greenhouse gas emissions by 11 percent over the next decade, the trade and industry ministry said Wednesday. The report mapped out the changes that consumers and industry would have to make in order to cut emissions of carbon dioxide and other gases blamed for global warming below 2005 levels by 2020. The Japanese and Polish governments have reached a basic agreement under which the Japan will purchase a portion of Poland's greenhouse gas emission quotas, it was learned Monday. It will be the Japanese government's second agreement on emissions trading following an agreement Tokyo signed with Budapest last year to purchase a portion of Hungary's emission quotas. Leaders from 16 countries including the Group of Eight (G8), China, India and Brazil will gather to discuss climate change on the sidelines of the G8 summit in July. Japan is to set aside $10bn (£5.1bn) over the next five years to help developing countries fight global warming, a newspaper has reported. The aid would aim to cut greenhouse gas emissions in nations like Indonesia and China, the Nikkei business daily said. 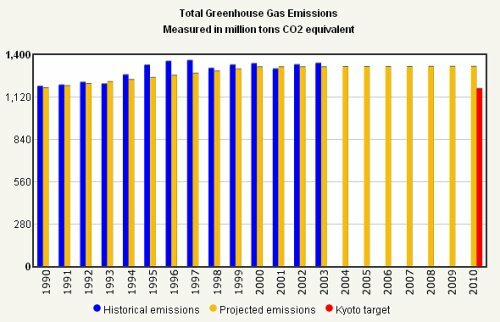 Japan wird nach aktuellem Wissensstand in den kommenden Jahren so viel Treibhausgas ausstoßen, dass es die Klimaschutzziele aus dem Kyoto-Protokoll verfehlen könnte. The Institute for Global Environmental Strategies (IGES) is a research institute that conducts pragmatic and innovative strategic policy research to support sustainable development in the Asia-Pacific region. The "Energy Rich Japan" (ERJ) report examines how Japan's energy need can be reduced and ultimately be covered by a sustainable energy system using exclusively local, renewable energies. This is shown utilising a demand model, a supply model and a simulation of the electrical system. The Japan Center for Climate Change Actions (JCCCA) is primarily concerned with providing information and giving assistance to Japanese citizens in order to promote national action towards combating global warming and climate change. This report summarises the findings from the third round of the Asia-Pacific multi-stakeholder consultations on climate regime beyond 2012 (held in New Delhi and Beijing) where four specific themes of importance to the region and the future climate regime (sectoral approaches, technology development and transfer, adaptation financing and mainstreaming, and developmental co-benefits of climate actions) were discussed. "Sustainable Asia 2005 and Beyond - In the pursuit of innovative policies"
Driven by buoyant economic development and continuous population growth, Asia is exerting exponential pressure on natural resources and the environment and it is feared that such trends may be accelerating. Based on the reports of six sectors, including forestry, freshwater, climate change, urban environment, business and environmental education, the report assesses the current environmental situation in Asia, reviews policy measures that are currently in place and presents a number of broad policy recommendations that promote sustainable development for the region.